William Jones was a prosperous tannery owner who operated his tannery along Little Hunting Creek in Thurmont in 1838. To show his prosperity, he built a six-room stone house on East Main Street. That was not enough, though. To give his new home a touch of elegance and class, he ordered new panoramic wallpaper from the French company of Jean Zuber. Eugenie and Daniel Rouzer purchased the home in 1891. The Rouzers’ daughter, Gertrude, and her husband, William Stoner, eventually inherited the house. Gertrude Stoner sold the house in 1961, and it was scheduled for demolition to make room for a grocery store (Thurmont Super Thrift at the time; now Hobbs’ Hardware). In 1929, Gertrude Stoner had written to Gregory and Brown Co., an interior decorating firm, trying to find out the history of the unusual wallpaper. J.C. Waterman replied saying the print was called “Scenic America” and was manufactured by a French manufacturer, J. Zuber in Rixheim, Alsace, France. The scenes were taken from a set of Currier and Ives prints and show American landscapes: Natural Bridge, Niagara Falls, West Point, and Boston Harbor. The wallpaper was an extravagant cost of $10.00 at the time. It journeyed from France to Thurmont in tin foil tubes to protect it from the moisture of an ocean crossing. The Stoner House provided a near miracle recently for a young man who had faith in his own judgment and real devotion to a cause. He is a 33-year-old Washingtonian named Peter Hill who, through a set of unusual circumstances, sold some very early 19th Century wallpaper that he bought for $50 for 250 times as much as he paid for it. The paper, which shows a scene of the Boston Harbor in the early days, and another scene of an Indian dance, brought $12,500 to the finder and his Danish-born wife and was later presented by the purchasers to the White House. Mr. Hill happened on to the paper on account of an interest in the history of religion and a zest for antique collecting. The antique collecting and selling has helped him make money to carry on the spreading of the gospel as a lay preacher. Through some of the heirlooms he found in the past that are now part of the historical collections at the Smithsonian Institute, Peter Hill met John Newton Pearce. Mr. Pearce is in the cultural section of the Smithsonian, and his wife, Mildred, is the White House curator. It was through her that Mr. Hill later aroused the interest of Mrs. John F. Kennedy in the scenic wallpaper. Last spring when he was in desperate need of money to carry on his religious drives, as if in answer to prayer, friends told him to go to an antique sale in Thurmont, Maryland. There a Mrs. Stoner was selling the furniture in her old house as it was being torn down in just a few days to make way for a chain store (Thurmont Super Thrift, now Hobbs’ Hardware). When Mr. Hill entered the house he noticed the magnificent wallpaper in the front hall and was told that in order to acquire it he must deal with the wrecking company. Hill told Stoner he wanted to purchase the wallpaper, but she told him he would have to negotiate with Ralph Miller who was in charge of the demolition that was scheduled to start in two days. 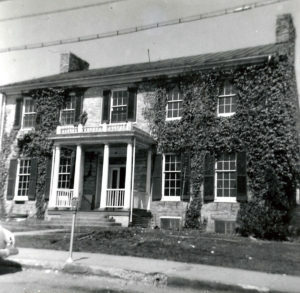 Miller told Hill that a woman had offered $100 for the wallpaper but would not be able to remove it before the house was demolished, according to a 1961 Frederick Post article. He paid $50 for the wallpaper and set to in a rush to remove it from the walls where it had been for over 100 years. He spent three days removing the complete set of “Scenic America” wallpaper with a razor blade and putty knife. After this was done, he called his friend Mr. Pearce of the Smithsonian and showed it to him. Mr. Pearce thought it a “find” and arranged with his wife to take it to the White House so Mrs. Kennedy could see it. On seeing the wallpaper, Mrs. Kennedy decided it was appropriate for the White House and indicated she would like to have it. Mrs. Kennedy and the Hills decided it would go well in the Diplomatic Reception Room which was at that moment being furnished with Americana by the National Society of Interior Decorators (NSID). They offered to buy the paper when they heard Mrs. Kennedy liked it. And, so, it was that the NSID complied with the wishes of the First Lady, and helped a young religious person to carry on his work by paying $12,500 for paper that had cost him but $50. The sequel to the story is that the NSID who paid for the paper has found out since that this wallpaper was made in the early 1800’s by a company called J. Zuber. The J. Zuber Co. is reputedly still making the identical wallpaper from old hand blocks and modern prints of this paper could have been bought for less than an eighth of the price they paid. 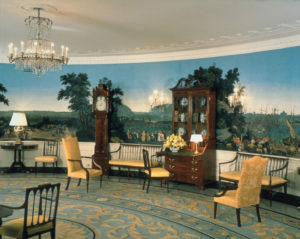 The Zuber wallpaper in the Diplomatic Reception Room at the White House.